When you were little, were there special dishes that someone made just for you as a special treat? 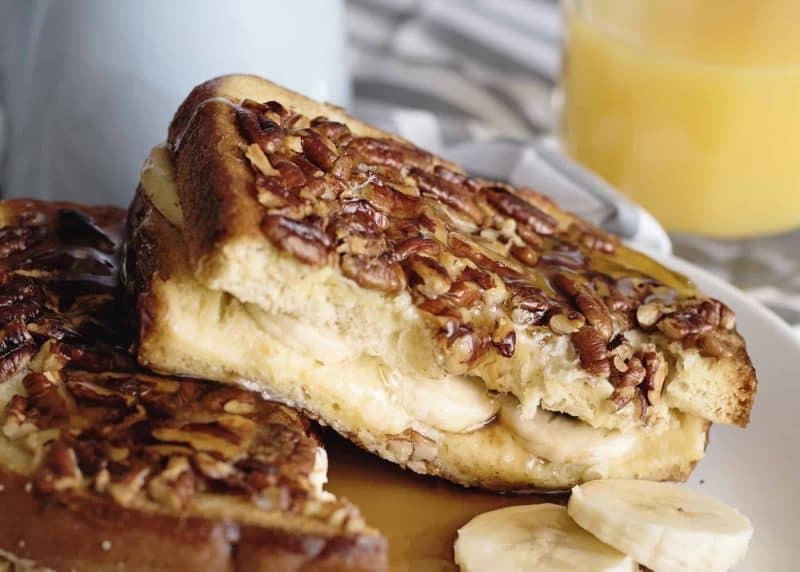 This Banana Pecan French Toast is one of those for me. Mama used to make it to surprise me on mornings when I had a special day ahead. The tradition held throughout my life. 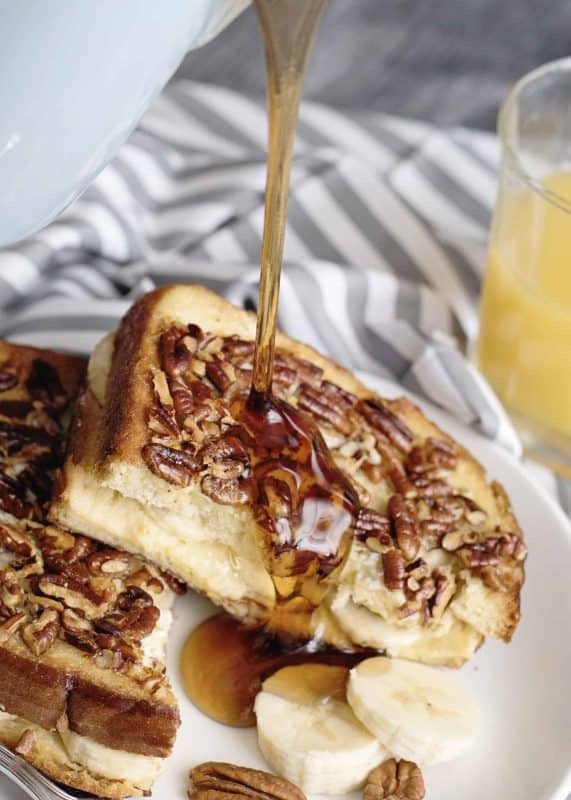 I remember the first day of my job as a bank teller when I was 18, waking up and putting on my shiny new business clothes, walking into the kitchen, and finding Mama plating up Banana Pecan French Toast with a big grin. It’s such a treat to make special things for your family. Little things like that remind them that they are treasured, important, and the act itself brings us just as much (if not more) joy to us as it does to them. Mama, I know you’re going to read this and I have it on good authority that we will find ourselves in a cabin in the smokies together before the year is out. I’m not saying you have to make this or anything but if you wanted to, I sure wouldn’t mind. 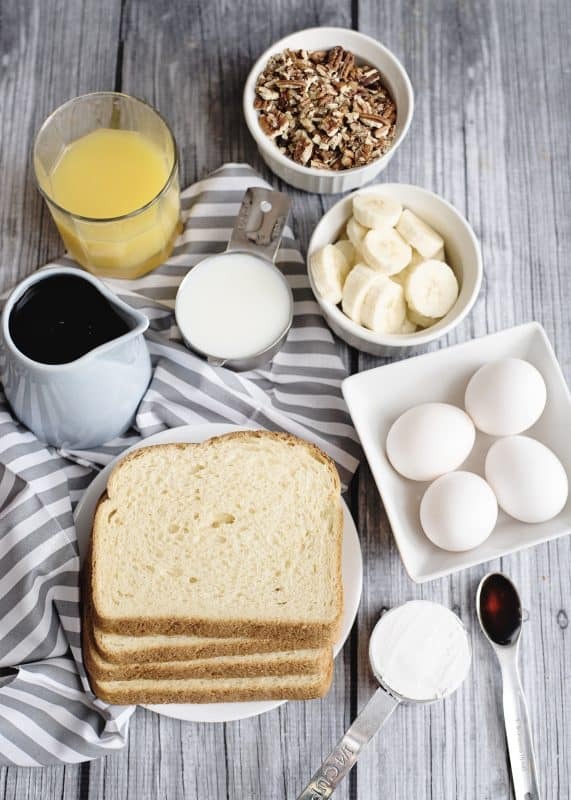 To make this, you’ll need: A few slices of a thicker bread such as egg or potato bread*, 2 sliced bananas, half and half, eggs, confectioner’s sugar, vanilla, pinch of salt, some chopped pecans, and some oil for cooking it in. *I definitely don’t recommend trying this with your standard white or wheat bread. 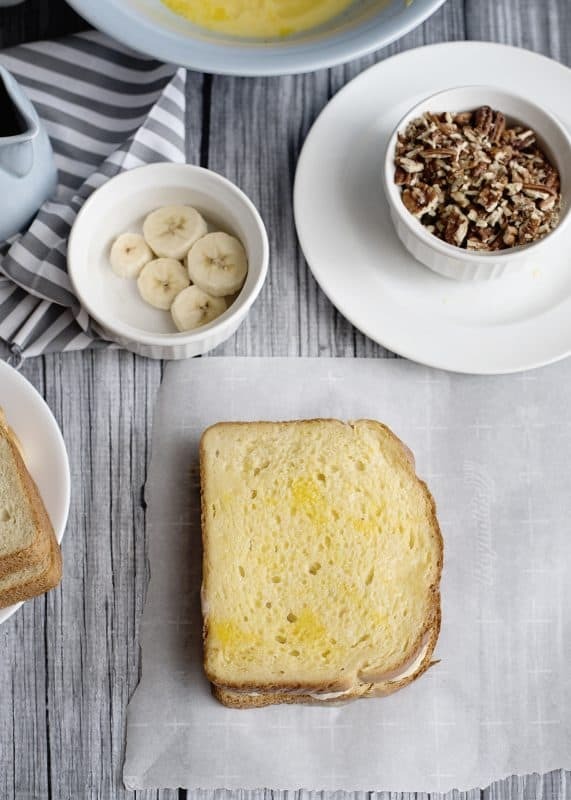 You really need a sturdier bread for the deliciously toasted outcome we want with this recipe. 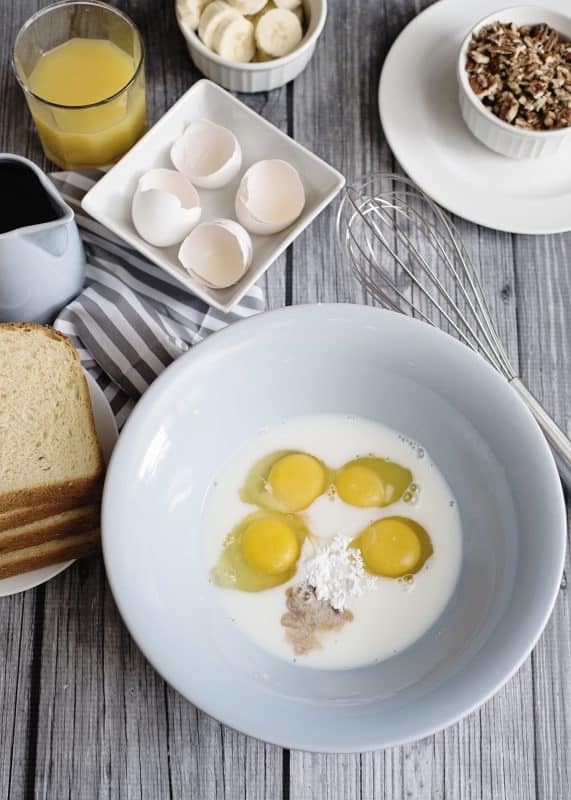 In in large shallow bowl, mix half and half, eggs, salt, confectioner’s sugar, and vanilla together well. Dip only one side of one piece of bread into the batter. Place the dipped slice, batter side down, on waxed paper. 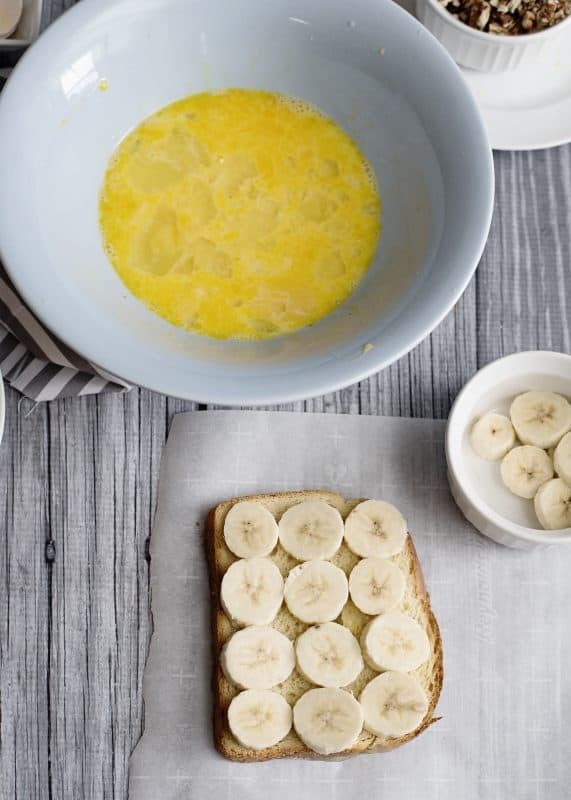 Layer banana slices on top of the bread. 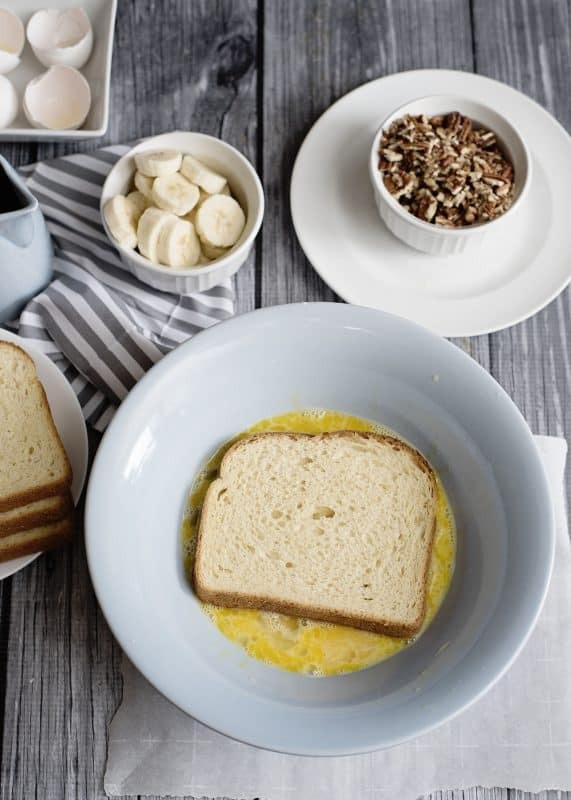 Dip *both* sides of the remaining piece of bread and place this on top of the bananas. 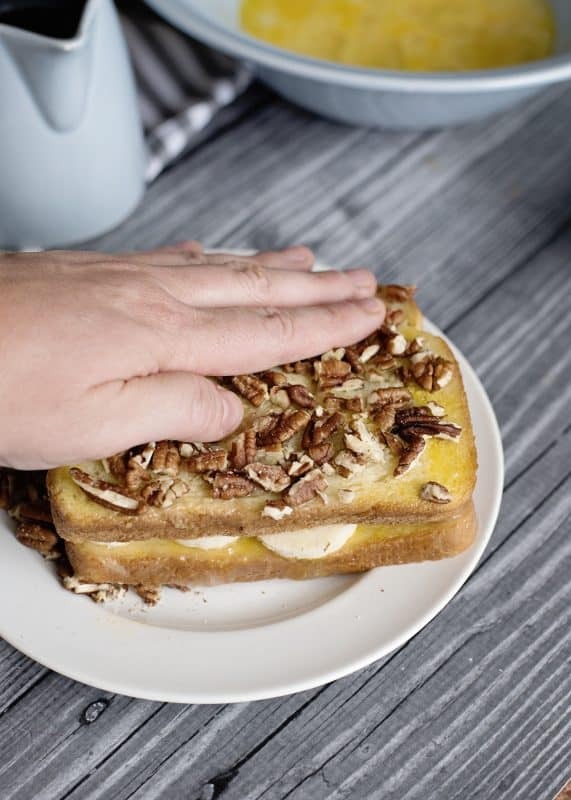 Place some chopped pecans on a saucer and lay the sandwich on top of them and press lightly with your hand to smoosh the pecans down in the bread a bit. 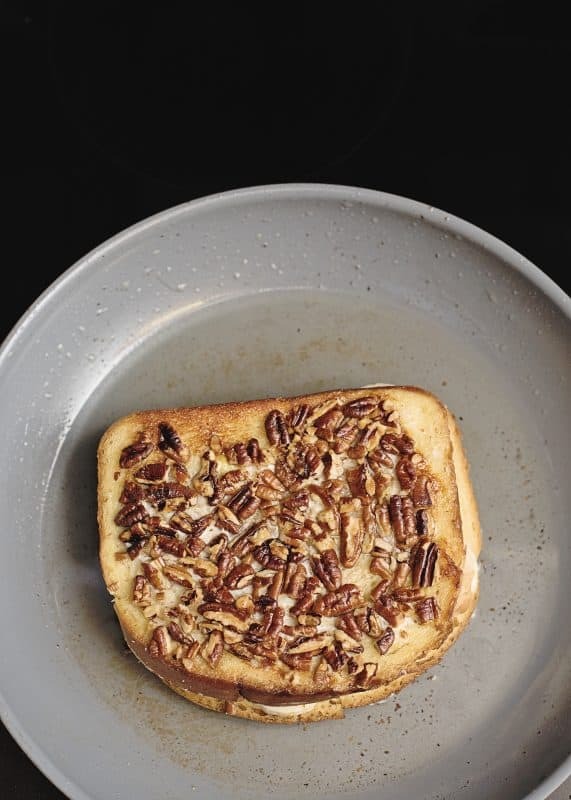 Flip the sandwich over and press into the pecans again to get them on the other side. Place a tablespoon or so of oil in a skillet over medium high heat. Put sandwich in skillet and cook until lightly browned on both sides. Oh. My. Goodness. Are you ready? If you like, you can sprinkle more confectioner’s sugar over it before serving but I like it just like this. Top with your favorite syrup. And enjoy your special day! In a large shallow bowl, mix half and half, eggs, salt, confectioner's sugar, ad vanilla together well. Dip only one side of one piece of bread into the batter. Place the dipped slice, batter side down, onto waxed paper. Layer the top of that slice wtih bananas. 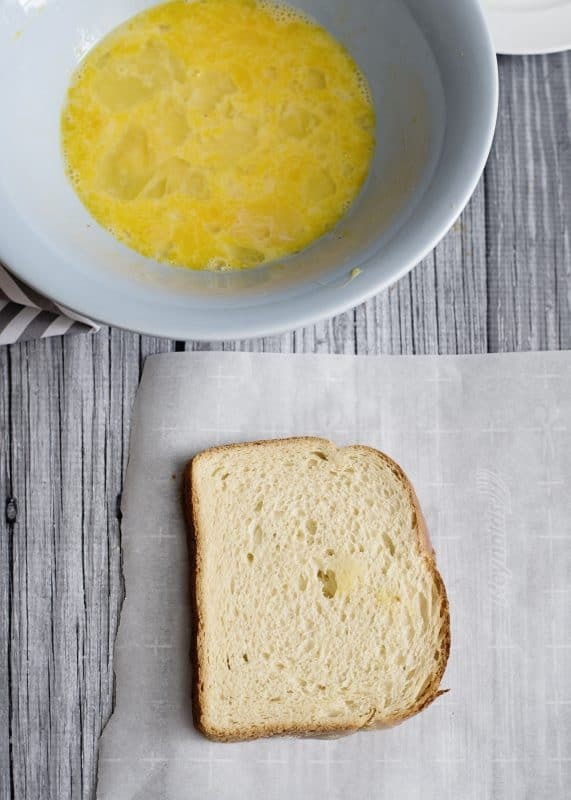 Dip a second slice of bread into the batter on *both* sides. Place on top of the banana layer, making a sandwich. Place pecans onto a sauce or small plate. Remove sandwich from waxed paper and place on top of the pecans, pressing down lightly to help stick them into the bread. Flip sandwich over and repeat. Heat 1 tablespoon or so of oil in a small skillet over medium high heat. Place sandwich in skillet and cook until lightly browned on both sides. Repeat with remaining slices to make two more servings. Did someone make you a “special occasion” meal growing up? I’d love to hear what it was in the comments! 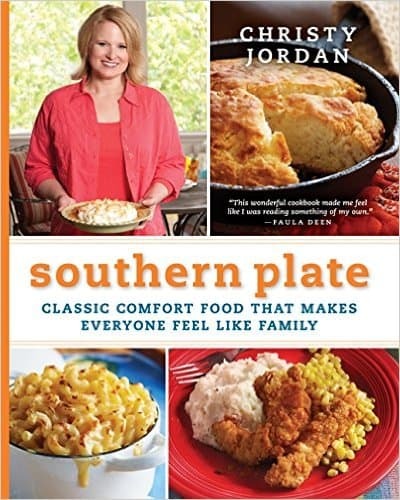 This recipe appeared in my first cookbook, the hardback one, Southern Plate- Classic Comfort Food That Makes Everyone Feel Like Family. Hi Christy I have memories of my Dad making french toast for us for breakfast when I was a girl, our french toast was 2 eggs to 3/4 cup milk, beat together and dip slices of bread then carefully fry them in bacon grease and serve with salt and pepper, I still have this as a special treat occasionally. Another great memory from my young days is Dad arriving home from a 3 day work stint and picking Mum up in his arms and twirling her around the kitchen, he was always happy to be home with his family. Thank you for sharing your recipes and memories with us, it kind of makes you feel like family too, from Judi in Australia. I consider y’all my family too Judi!! What great memories of your dad, he sounds like such a wonderful and special man!!! Can’t remember a specific special occasion meal but one of my favorite memories is coming home from school in the winter and mom would have a beef roast in the oven. I remember the windows in the dining room being fogged up from the heat of the oven. You know how something makes you feel safe? Those particular days always made me feel cozy and safe. Thanks for reminding me of that today. THANK YOU so much for lightening up on the ads! 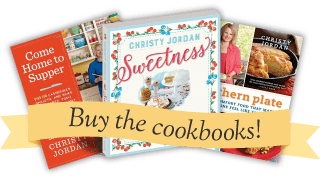 I can now really enjoy your recipes and stories!! 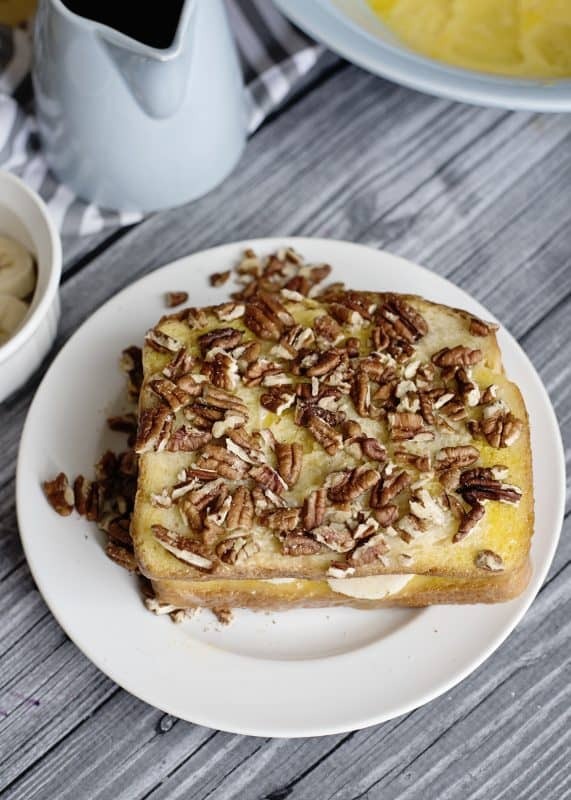 LOVE this recipe for banana pecan French toast! Will definitely be making it! Sounds wonderful! The feelings and the food! I’m wondering why the dipping is only on one side of one piece of bread, and both sides on the other- is there a special reason? Ask your Mim, please! But I would think it would cause the inside to be a bit gooey if you did both sides. That was supposed to say “ask your Mom”! Mimi is my grandma! You are so right Susan, I think it has to do with Grandmama’s love they have for us too!!! My mom used to make Swedish pancakes every Saturday morning…one pancake at a time from scratch! One Saturday she didn’t for some reason and that day my brother was killed in an avalanche skiing that afternoon. She was so upset that she hadn’t fixed his favorite breakfast that day. I now fix Swedish pancakes for my dad every Sunday morning. Oh goodness, that breaks my heart for your sweet Mama.